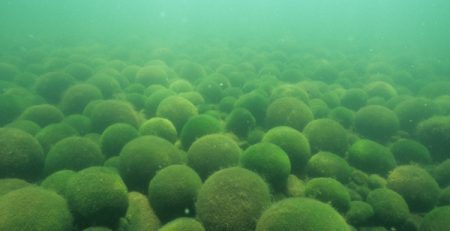 The bottom of Lake Akan is inhabited by miraculously spherical algae called “marimo.” These are the National Treasure of Japan. 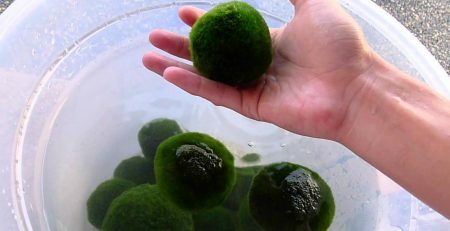 Although marimo and its related species are observed in the lakes of several European countries and in some other lakes in Japan, only in Lake Akan marimo grow 20 to 30 centimeters (8 to 12 inches) in diameter and have a spherical surface that is beautifully soft and smooth like velvet. These “moss balls” are the latest craze to hit the aquarium plant hobby. They actually are said to be great for algae control because they “outcompete” the algae by using the same nutrients and starving the algae. In its natural habitat, their ability to move around by using the undercurrents to sink or rise in order to position themselves to receive plenty of light to carry out photosynthesis is interesting. 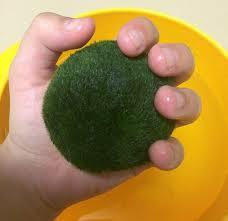 What is Marimo?… its technical term is Cladophora aegagropilait is a spherical moss ball of Algae. These balls are very simple to raise. Marimo neither requires special care nor occupies much space, as it is grown in a glass jar or even in a fish globe with fishes. No sun light is necessary, and of course, fertilizer is not needed. 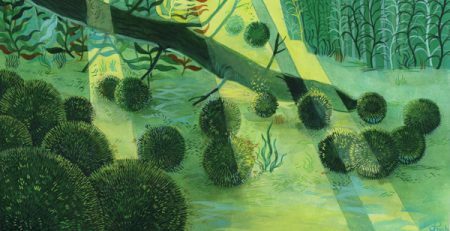 Softly rinsing off moss on the ball and gently tapping it in order to help it form a perfect spherical shape with a finger on a palm when changing water once a week are all that it takes. A Marimo vase can be placed anywhere below 25 degree. Unlike pets such as dogs or cats, of which the owner feel uneasy to leave them alone at home, and might grow up to have an abnormal character, there is nothing to worry about Marimo. In addition, this algae is free floating, and displays unique behaviors according to habitat changes. As it is photosynthetic, it floats or sinks in the water in response to columns of light, and actually rolls around on the bottom of the aquarium. Thereby, it is mistaken with animals because of its movement, which is another factor that grabs people’s interest. Moreover, as its life span is quite long – the biggest Marimo ball is known to have lived over 100 years. Breeding the algae balls in right condition, one can hand over a couple of generations from grandparents to a grandson, working as a medium of family love. The main reason for it gaining public favor would probably be due to the legend; once there lived a daughter of the chief of a tribe around Lake Akan. She fell in love with a commoner, but confronted opposition of her parents. She ran away with him and sublimated into Marimo. For that myth, in Japan, it has become spotlighted as “love plant,” which realizes true love and accomplishes one’s heart’s desire when it is given and taken as a present. It has crossed the ocean to reach the States and is welcomed by children, lovers and parents. Spherical marimos are formed through the growth of a core which is a fragment of ancestral marimos. So when you watch the cross section of the spherical marimo, you do not recognize a core-shell structure in it. How about the most ancestral marimos? It is expected that the most ancestral marimos had a core made of inorganic materials such as cray particles or sand solids. This is a genus of reticulated filamentous Ulvophyceae (green algae). The genus Cladophora contains many species that are very hard to tell apart and classify, mainly because of the great variation in their appearances, which is affected by habitat, age and environmental conditions. Unlike Spirogyra the filaments of Cladophora branch and it doesn’t undergo conjugation. There are two multicellular stages in its life cycle – a haploid gametophyte and a diploid sporophyte – which look highly similar. The only way to tell the two stages apart is to either count their chromosomes, or examine their offspring. The haploid gametophyte produces haploid gametes bymitosis and the diploid sporophyte produces haploid spores by meiosis. The only visible difference between the gametes and spores ofCladophora is that the gametes have two flagella and the spores have four. The Cladophora species can be a major nuisance causing major alteration to benthic conditions linked particularly with increased phosphorus loading. 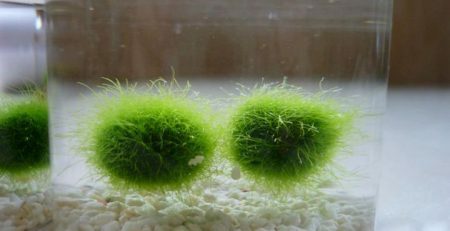 The population of natural Lake Aken Marimo balls is still dwindling and there is much research being done now to try to save or recreate this unusual form of Cladophora. As of yet no breakthroughs have been made. So only other kinds of Marimo are available. Marimos are a popular “pet” in Japan, but you can’t keep the National Treasure as a pet, so they buy the artificial one instead. 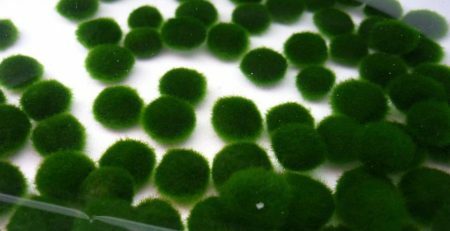 Although the mechanism of how the spherical marimo are made is not known in detail, the alternative method of making marimo were invented from about 30 years ago by many Japanese scientist/botanist/marimoist. There are several ways to make artificial marimo, and you can buy the one made these ways at flowershops/ petshops in JPN. 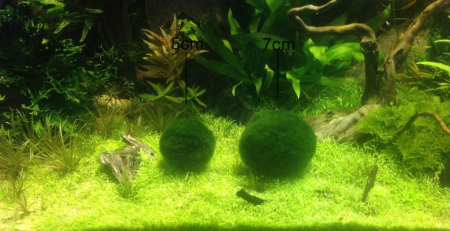 However, artificial marimo, or fake marimo, have clear difference from natural ones. When divided in the middle, the artificial marimos show no pattern or any sort of order. One can only see the fillament randomly tangled like a spaghetti. In contrast, natural marimo shows highly ordered structure of algae filaments; all filaments are lined up on an ordered way to form a radial pattern. In addition, the filament density of the core is very low (often nearly zero). 3) Rotating positions with other Marimo on different tiers of the lake bottom. This last phenomenon allows Marimo to be found at deeper depths than light would allow for stationary plants. 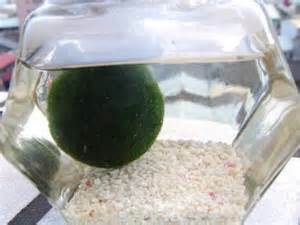 If the marimo you are cultivating is floating, that is not entirely bad, since the algae grows through photosynthesis. Small oxygen bubbles around the body of the marimo are the reason why it floats. It most probably will sink back to the bottom of its container within a day. If the marimo continues to float, it is a distinct sign that its center has begun to become hollow and rot.